You could imagine a car without a steering wheel but not automatic mechanizations in place without a chassis, would you? The car wouldn’t be able to function in the first place! Could you imagine a 21st century world in the Middle East, the globe being in midst of a severe military crisis, functioning without an armed force? Could India be the secular nation it is despite an all-encompassing cultural diversity, had there been no democracy? Could there be an ocean had there been no concerted tributaries that got segregated water-bodies to flow together? Or say, a national anthem without moving lyrics and poignant meaning. This world doesn’t and cannot function in isolation. Perhaps it isn’t meant to be like that. And hence we have the crises, polarities, conflicts and differences. One needs some glue that can bring everything together. There needs to be a force that can orchestrate action, harmonize efforts and when needed, give up action in isolation to become one with a unified goal. In the light of these, it won’t be incorrect to hail Rahul Dravid as the force that brought everyone together. His omnipresence in India and circles where his unsung contribution was respected, being the glue that got a country divided on cricket, religion, politics and the man’s own contributions closer with itself. 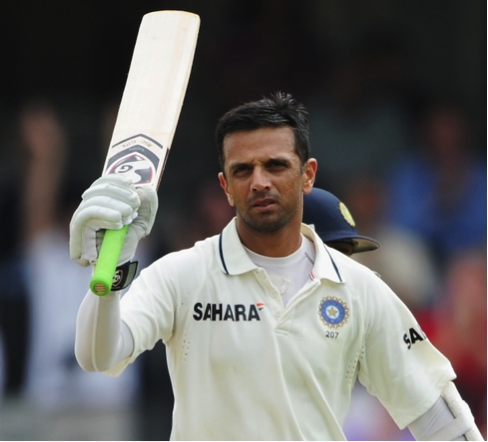 At 43, post scoring 13228 Test runs, over 10,900 ODI runs, 48 international hundreds and a commanding tally of 36 test centuries with the unique distinction of having struck a Test hundred against every test-playing nation, interestingly, the Rahul Dravid question about his true standing in cricket is as important a query as any dominant discourse of our time and as perplexing a maze as any you’ve solved. Is the man described famously as, ‘The Wall’ a largely gothic figure looming under the shadow of Sachin Tendulkar, India’s more famous son? Or is Dravid the Field Marshal, embattled and impassioned, having given the last pious ounce of sweat and blood for India’s cause an infallible structure built on valiance and splendor and, defined by modesty and self-righteousness, the latter being a rarity in today’s world? Whatever it might be, the beauty of understanding India’s most defiant and famous number 3 batsman lies submerged in the awe-inspiring statistical numbers and beyond the charisma and the exploits garnered on the turf. A game which most agree he bettered through a classical technique that remained unconquered till the end, despite the man holding the unique distinction of being bowled on 50 plus Test occasions, Dravid’s uniqueness lay in the distinct approach he brought to the game, conducting himself with a humility, simplicity and yet, compassion for the team and for the sport, in general. If there is a term called ‘purist’, then Dravid, perhaps the giant from a Jurassic age that functioned on purity and toward upholding the dignity of the game was that purist. How often have we seen cricketers molding the game in their favor? And then, there was this mellow warrior, unbent in his passion to regard the game he came to love and in turn master, who played selflessly doing all he could for India. You must not forget that in this due course of operating as the crisis-handler and problem-solver, Dravid was derided and actually, booed by a crowd that remained as ecstatic in its Dravid dismissal as it cheered for the next batsman coming in, which was Sachin Ramesh Tendulkar. Finding himself in a legendary Indian batting contingent that beautified the game as much as saving it from sheer obscurity, Dravid batted alongside pioneers of batsmanship- Tendulkar, Ganguly, Laxman, Sehwag and Yuvraj. And more often than not, when none of these played alongside one another, Dravid was the constant figure of inspiration at the other end. 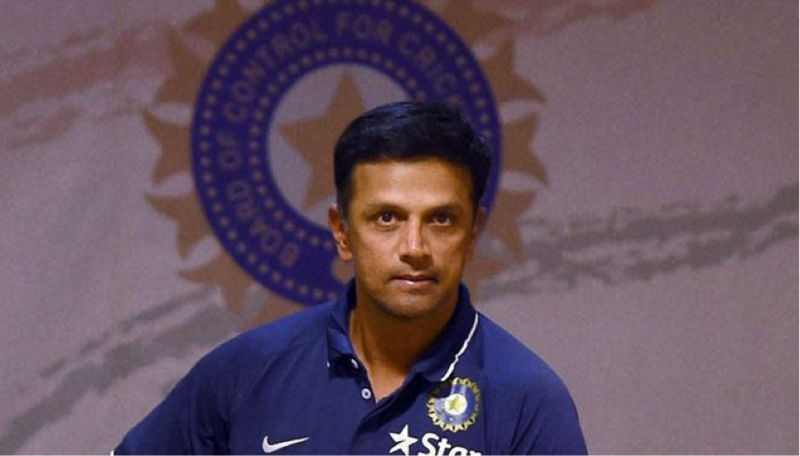 Ian Chappel is known to have said, ‘team in trouble, who do you look upto, Dravid!’. 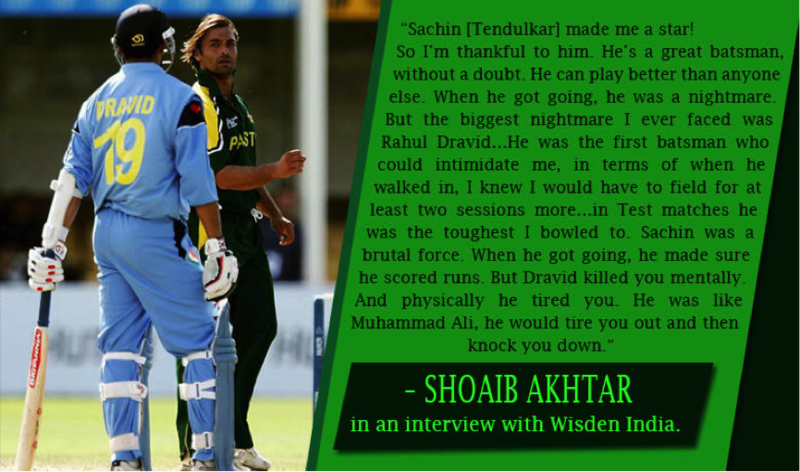 Sachin, gladly has said none can take his place at number 3! Not that ‘The Wall’ is cribbing one bit that Pujara at number 3 and then, Rahane at number 5 present the Bangalorean with as much glee as pride. What Dravid has eternally wanted has been a stable unit that plays together for a common goal, one he lent his magnificent powers of concentration in achieving: stabilizing India’s 22 yards crisis. What his wall was built on? 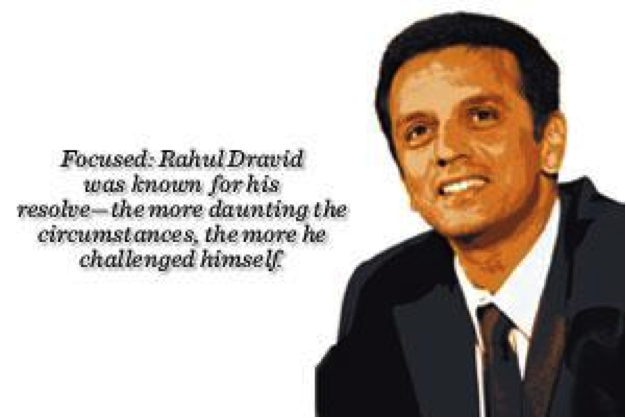 Through a unique constellation of concentration, hard work, relentless work ethic and toil, Dravid walked the talk, one of his bat, rarely relying on words, for he was Cricket’s true gentleman. 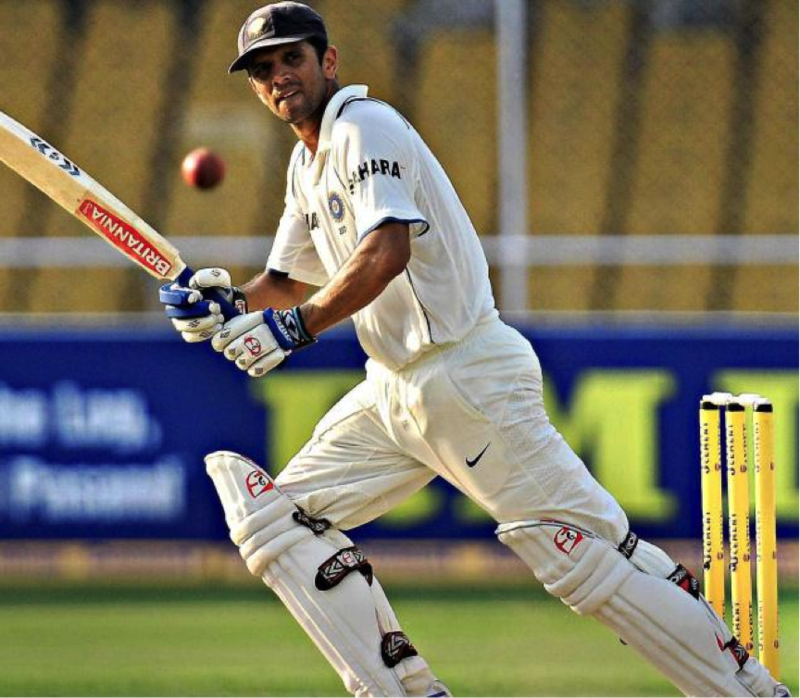 Seeing off the likes of Alan Donald, holding onto the pitch fending off Walsh, Ambrose and Waqar and, tackling Murali, Pollock and Warne, Dravid stayed focused for long periods of concentration. But thankfully, those were the meteoric days of Test Cricket, when Perth bounced a lot more, when Jamaica experienced some swing and Lahore was more than a flat batting wicket. Plundering heaps of runs abroad, Dravid held the mantle of Test’s true mark of greatness, by taking on Glenn Mcgrath and Gillespie at their own den and attacking Caddick, Pollock and Saqlain on home turf. So inspiring has been his patient stay at wicket that, at times it seemed, you could finish all your days work, including the tedious grocery shopping with Dravid still holding fort. It’s that rare sight with a dad dropping off kids to a school and picking them up in the evening only to switch on the television to notice the ‘Wall’ undefeated by the end of a day’s play. Speaking of dropping kids to school, Samit and Anvay’s doting father does exactly the same when not attending to other kids on the ground- guys like Karun Nair, Shreyas Iyer, Sanju Samson and the latest sensation, 17 year old Prithvi Shaw of Mumbai. Nair, the triple centurion and Prithvi who struck a mighty 500 plus days before credit their success to Dravid ‘Sir’. So special has been the bond between Team India’s batting stars and Dravid that Pujara and Rahane, both of whom have modeled their technique on the impregnable technique on the Wall, admit that it is Rahul’s defiant contribution in lifting their game. Even a cricketer as firebrand and dynamic as Virat looks up to Rahul, the stalwart’s shadow staying as down to earth as it is seminal in its adulation of the game and vice-versa, world-over. But beyond the immediate realm of the greatness of the game, Dravid is and should be respected most for being the character he is, that has so handsomely contributed to those gigantic statistical accumulations. 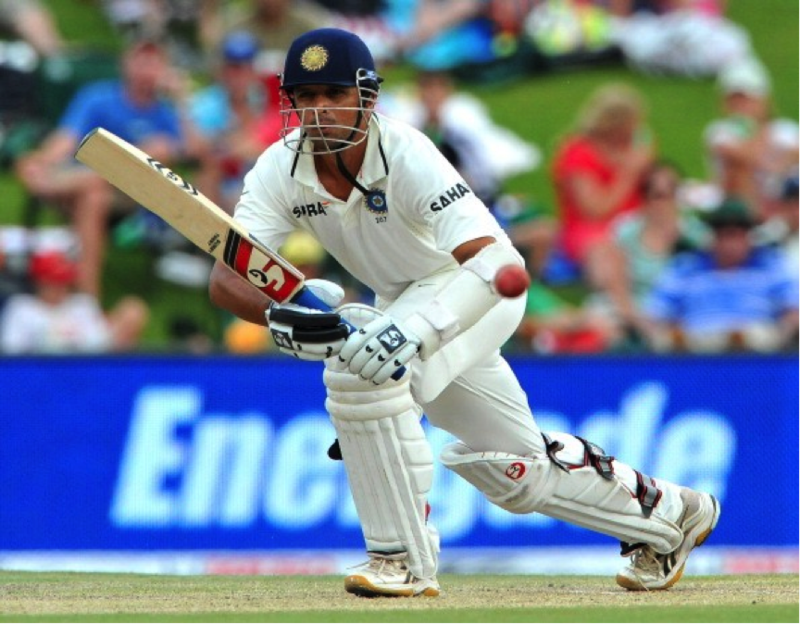 He has shared most 100 run Test partnerships with a man in whose shadow his iconic career blossomed, Tendulkar. The highest Test partnership for India was between Sehwag and Rahul at Lahore, where the ‘lions’ cleaned up Pakistan in an ethereal 410 run stand. In the final moments of his career, on that loathsome tour to England, as Tendulkar, Gambhir, Sehwag, Laxman faltered, Dravid dug up a well of concentration on 22 yards in which he dragged James Anderson, Stuart Broad and Chris Tremlett. Striking 468 runs in the Test series where his India were blanked out, he struck 3 hundreds, his highest being an imperious 146 not out. The eternal battler, the lonesome traveler, the undefeated and the champion refusing to accept the mantle, Dravid, criticized for his limited over strike rate ended up with 10800 plus runs, scoring 12 centuries, ending his final game with an impressive 69 off 79. But then, the man never desired it. It conveys the sense of guilt we Indians warrant a man we spent hours ‘criticizing’ for he took his time to settle in. His fault was that he took time in wearing down bowlers who hunted in packs to destroy India. That most of his centuries resulted in India’s victories are as implicit in making the Test unit what it is today as is a Chris Gayle’s knock in shining the surface of a T20 contest. He batted slowly. Yes he did! 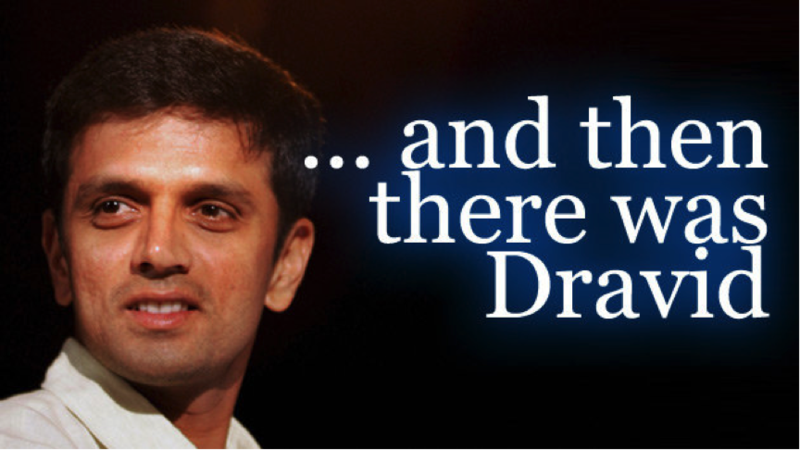 In fact, on Dravid’s watch, time came to a standstill, for he took matters in his own hands. But in the process of constructing his typical lasting monument, the bricks transformed into a spiritual pedestal of staid reassurance and rock-solid tensile strength. It became the Wall that he constructed to counter India’s nemesis and to test their will. By the time he was dislodged, rarely by self-destruction, India were safe and the enemies lay at bay. If that minutely helps in understanding Rahul Dravid’s contribution to Indian Cricket, then one feels, the purpse of this day is met.